The main speaker at the event will be Shannon Vyff, Chair of the strikingly-named “Immortality Institute” – which describes its purpose on its website as “advocacy and research for unlimited lifespans”. I’ve briefly met Shannon a couple of times at conferences, and found her to be articulate and well-informed. Earlier this year, I read and enjoyed the book Shannon wrote primarily for teenage readers, “21st century kids: a trip from the future to you” (see here for my review). To prepare myself for the meeting on 28th November, I’ve started reading another book: “The scientific conquest of death: essays on infinite lifespans“. 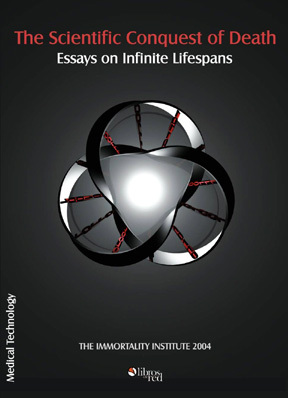 This book is published by the Immortality Institute and consists of a series of essays by 19 different authors (including a chapter by Shannon). How would this book be special? After careful consideration, the answer seemed clear: This should be the first truly multidisciplinary approach to the topic. We would discuss not only biological theories of aging, but also biomedical strategies to counter it. Moreover, we would consider alternative approaches such as medical nanotechnology, digitalization of personhood, and cryobiological preservation. But this would only be part of the whole. I plan to write another blogpost once I’m further through the book. To answer your question, what do I personally see as the benefits of extending healthy human lifespan? In short, life is good. Healthy, vibrant life is particularly good. While I have so many things I still look forwards to doing, I don’t want my life to end. For example, I’d like to be able to share in the wonder and excitement of the scientific, engineering, artistic, and cultural improvements all throughout the present century – especially the development of “friendly super AI”. I’d like to have the time to explore many more places in the world, read many more books, learn much more mathematics, play golf on all the fine courses people talk about, and develop and deepen relations with wonderful people all over the world. I’d like to see and help my grandchildren to grow up, and their grandchildren to grow up. Extending healthy lifespan will also have the benefit that the living wisdom and creativity of our elders will continue to be available to guide the rest of us through challenges and growth, rather than extinguishing. In summary, I want to be alive and to actively participate when humankind moves to a higher level of consciousness, opportunity, accomplishment, wisdom, and civilisation – when we can (at last) systematically address the dreadful flaws that have been holding so many people back from their true potential. I believe that most people have similar aspirations, but they learn to suppress them, out of a view that they are impractical. But science and engineering are on the point of making these aspirations practical, and we need new thinking to guide us through this grand, newly feasible opportunity. I expect to revisit these topics during the meeting on 28th November. I’m looking to gather a series of key questions that will highlight the core issues. Looks like a very interesting book – especially from the social point of view. Does it also cover the areas of Psychology? Just that recently I read part of a book called Learned Optimism by Martin E.P. Seligman and he mentions some of the studies done into happiness. Basically happy people live longer and are generally more successful and healthy. The best book I’ve read on the psychology of happiness is “The happiness hypothesis” by Jonathan Haidt – see here for my review. This book has an endorsement on the front cover from none other than Martin Seligman: “For the reader who seeks to understand happiness, my advice is: Begin with Haidt”. WHSmith.co.uk have a copy of the new paperback version for £6.49 – cheaper than in their own shops so I’ve ordered a copy. You do have to spend over £15 to get free delivery but that’s not particularly difficult for me! I’m sure it will make interesting reading when I’m on holiday in Cuba over Christmas so thanks for the recommendation and link to your review.